I really liked Griffon Extra Pale and I’ve always liked red beers so here it is. 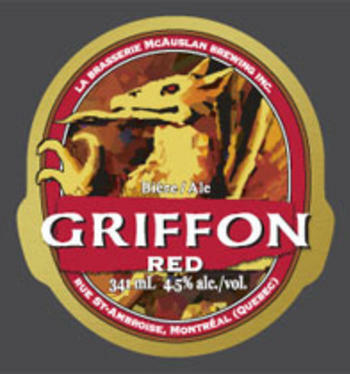 Griffon Red Ale is a %4.5 ale with a dark colour and a little bitterness to it. It’s still clean crisp and refreshing. A far cry from the Apricot and Wheat beer that is in the same taster pack when I bought it those went straight to someone else or they would have ended up down a drain. Ok for again this is from McAulsan brewery in Montreal commonly know to most people as the St. Ambroise brewery to many since its usually the bigger print on the bottle. I wasn’t as blown away with this as I was the extra pale but it is really good.